SikhNet's Guruka Singh shows off "Hot Socks" in front of Guru Granth Sahib Ji insulting Sikhs in UK! In the first instance Guruka shamefully displays "Hot Socks" in front of Siri Guru Granth Sahib Ji while ignoring pleadings from Gurdwara sevadars! Guruka says~ "The sevadar urgently whispering in my ear “Socks! Socks! You must take off your socks! No ‘hot socks’ allowed in the Gurdwara”. In the second instance Guruka disputes the authority of a UK Gurdwara's "Gyani" to discipline a young Sikh girl for wearing disrespectful tights in the Darbar of Siri Guru Granth Sahib Ji as the Gyani rightfully did. Guruka will not be successful in imposing his Yogi Bhajan tantric conduct on Sikhi! "Sikhs in UK demand answers from Guruka of SikhNet concerning his use of toenails as a magic talisman" https://www.youtube.com/watch?v=zgLm4sajsT0&list=UUQDV5etGNZ9AnZ-3PnLklzw. Sadly it seems Guruka Singh has no respect for Gurbani as he also keeps Yogi Bhajan's fingernail clippings in his Nitnam! Guruka says, "Then he (Yogi Bhajan) looked at me ( Guruka Singh ) & extended the wrapped napkin to me saying, "You want these (Yogi Bhajan's fingernails), right?" I replied in the affirmative. He smiled and said, "They will give you a lot of power and protect you." I took the folded napkin gratefully and thanked him.... I kept the nail clippings in the napkin and placed them in my Nitnem." http://es.3ho.org/community/your-stories/hanging-his-fingernails-self-sensory-human-action. Guruka of SikhNet will be taking questions from the sangat and teaching Yogi Bhajan's kundalini yoga at various Gurdwaras and Khalsa schools this week in the UK. Here is the SikhNet link showing the locations and times: http://www.sikhnet.com/news/sikhnet-ceo-england-camps. 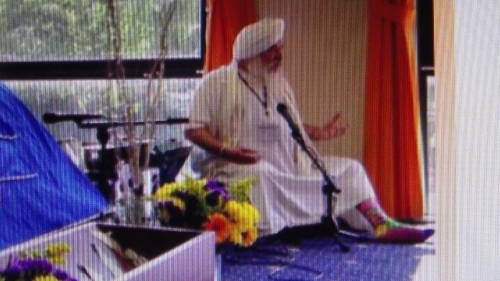 "New photos of Yogi Bhajan tantric / kundalini yoga dancing expose SikhNet & 3HO's beadbi of Sikhi" https://www.youtube.com/watch?v=I8xLrxELKyE&list=UUQDV5etGNZ9AnZ-3PnLklzw. Yogi Bhajan given Hindu last rites. Part I: Emblem of his beliefs. By Anju Kaur, SikhNN staff writer, Washington Bureau. Posted: Sunday, November 24, 2013 | 01:13 pm. "Stone idol worship by Yogi Bhajan SikhNet 3HO partners alarms Sikhs!". "(1) New 10 foot high Yogi Bhajan idol funded by SikhNet tantric yoga cult disturbs Sikhs". "(1) SikhNet & Yogi Bhajan kundalini yoga sect absent from Sikh Nation Freedom March in San Francisco". "SikhNet "collaborating with 3HO Europe to bring Kundalini Yoga Teacher Training to India". "Assassination plot against Sant Bhindranwale Ji by Indira Gandhi & Yogi Bhajan uncovered! " "Newly uncovered Yogi Bhajan Phallus Tantric Drawings".